To provide a durable repair over the life of the patient, an endovascular aneurysm repair must seal in healthy aorta. As a result, many aneurysm patients are not suitable candidates for standard infrarenal or thoracic endovascular grafts. To treat the patients, a group of innovators focused on incorporating branches into endovascular repair in order to achieve seal zones in healthy aorta. 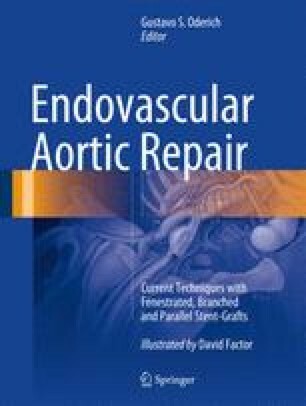 This chapter details the development of fenestrated and branched endografts from the first prototypes and clinical cases with simple fenestrated grafts in the late 1990s to the most recent developments where patients can be offered the possibility of endovascular treatment of the entire aorta from the sino-tubular junction to the internal and external iliacs. Specifically, we discuss devices developed to treat short neck abdominal aortic aneurysms (AAAs), juxtarenal or pararenal AAAs, iliac aneurysms, complex thoracoabdominal aneurysms, and aortic arch. A global, collaborative, multidisciplinary team was required to translate ideas, philosophies, and technologies into viable new devices and therapies for patients. In addition to physicians from multiple specialties, the team included innovative engineers and technicians who applied their skills in prototype manufacture development and testing. Fenestrated and branched stent-graft technology is based on a common set of fundamental principles: achieving seal in healthy aorta, matching the native anatomy whenever possible, and optimizing the endovascular repair for long-term durability. These philosophies have been validated through publications of single-center experience, prospective single-center trials, and multicenter prospective trials.